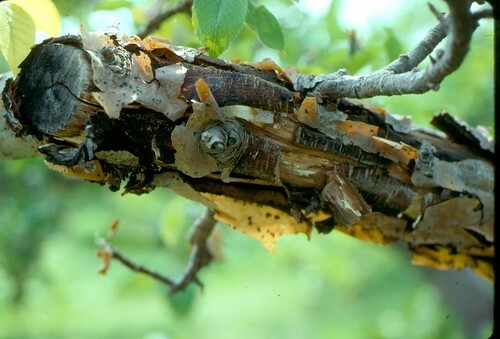 Black rot is a fungus disease that can cause serious losses in apple orchards, especially in warm, humid areas. The black rot fungus covers a wide geographical range and can infect many hosts other than apple. The role these hosts play in the spread and development of the disease is not known. Three forms of the disease can occur: a leaf spot known as frogeye leaf spot, a fruit rot, and a limb canker. Severe leaf spotting can result in defoliation that weakens the tree, infected fruit become unmarketable, and limb cankers can girdle and eventually kill entire branches. Leaf symptoms first occur in early spring, when the leaves are unfolding. They appear as small, purple specks on the upper surfaces of leaves and enlarge to circular lesions 1/8 inch to 1/4 inch in diameter. The margins of the lesions remain purple, while the centers turn tan to brown. In a few weeks, secondary enlargement of these leaf spots occurs. At this time, the lesions assume a characteristic frogeye appearance (fig. 1). As a lesion ages, a series of concentric rings develops around the original infection point. Occasionally, small, black pycnidia (asexual fungus fruiting bodies) grow in the center of the lesion. Heavily infected leaves become chlorotic, and defoliation occurs. If defoliation occurs on a yearly basis, tree vigor is greatly reduced, and the tree becomes stressed. Figure 1. Frogeye leaf spot caused by the black rot fungus. Photo: Alan R. Biggs, West Virginia University. Fruit infection, of which sepal infection is the most common form, can occur early in the season. These infections result in calyx-end rot later in the season (fig. 2). 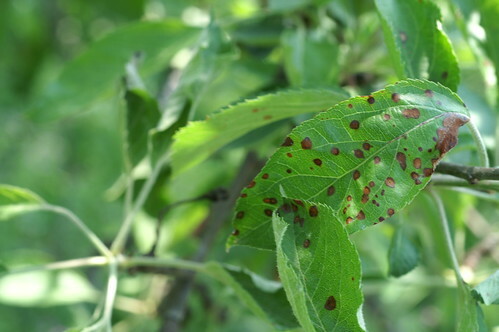 In early fruit infection, lesions begin as reddish spots and later become purple bordered by a red ring. 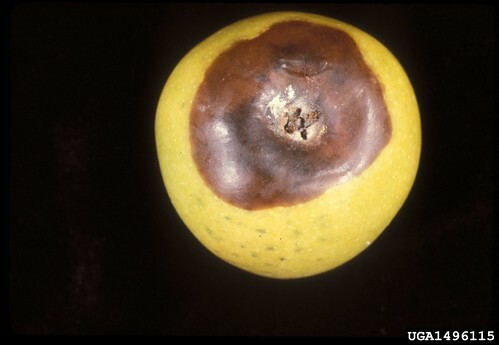 Infected areas on mature fruit become black, are irregular in shape, and are occasionally surrounded by a red halo. As the rotted area enlarges, a series of concentric bands—uniform in width and alternating in color from black to brown—forms. The flesh of the rotted area is firm and leathery. Black pycnidia often grow on the surface of the infected fruit. Eventually, the fruit becomes a dry mummy that may remain attached to the tree. Figure 2. Black rot infection of apple at the calyx end. Photo: University of Georgia archives. Lesions resulting in canker formation usually arise from a wound in the bark. In the early stages of the lesion, the bark is slightly sunken and reddish brown. Some cankers remain small and die out by the end of the year; others enlarge from year to year. Some cankers involve merely a superficial roughening of the bark (fig. 3). In other cases, a canker can kill the bark to the wood, and the area becomes cracked (fig. 4). By the end of the second year, fruiting bodies of the fungus appear in the cankered area. Limbs can be completely girdled by this time. The black rot fungus often is on wood previously killed by fire blight or damaged by cold temperatures. Figure 3. Black rot canker on an apple branch. Photo: Alan R. Biggs, West Virginia University. Figure 4. Black rot canker associated with winter injury on an apple tree main trunk and scaffold limbs. Photo: James W. Travis, Penn State University. The fungus overwinters in cankers, especially in those initiated by fire blight; in dead bark; and in mummified fruit. The overwintering structures provide a significant source of disease inoculum. In the spring, the fungus releases spores during rainfall. The amount and duration of rainfall as well as temperature are the main factors influencing spore release, germination, and infection. Conidia are primarily waterborne and continue to be produced during wet periods throughout the summer. Ascospores are primarily airborne and are most common during the petal fall period. Ascospores and conidia germinate after 4 hours of wetting when the temperature range is 61°F to 90°F. Below temperatures of 61°F, infection occurs only during longer wetting periods. The optimum temperature for leaf infection is 80°F. At this temperature, infection occurs after a 4.5-hour wetting period. Leaf infection will not occur, however, at 46°F even when leaves have been wet for 48 hours. For fruit infection to occur, temperatures must be between 68°F and 75°F during a wetting period of at least 9 hours. During rain, conidia ooze out by the thousands and are disseminated by splashing rain, wind, and insects. Spores attach themselves to the plant, germinate in a film of moisture within 5 to 6 hours, and penetrate the leaf surface through stomata. Early season infection of fruit also occurs through stomata. Later in the season, infection of fruit occurs through cracks in the cuticle or via wounds and possibly lenticels. Often, harvest injuries become infected, and the fruit may decay during or after storage. 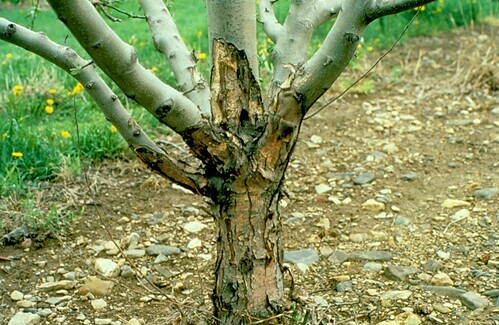 Throughout the growing season, infections occur through wounds in the bark or on killed wood. To help reduce the incidence and severity of the disease, remove dead wood, mummies, and cankers from trees. Remove and burn current-season prunings, or rake them and then chop them with a flail or rotary mower. Avoid leaving piles of prunings on the orchard perimeter as these can serve as sources of fungal spores. The main method of control is application of fungicides from silver tip through harvest. Apple cultivars do not vary greatly in their susceptibility to black rot fungus; however, 'Empire' and 'Cortland' may be slightly more susceptible than others. Original text prepared by J. W. Travis, J. L. Rytter, and A. R. Biggs. The original version of this article appeared in The Mid-Atlantic Orchard Monitoring Guide (NRAES-75) and is reproduced with permission from the Natural Resource, Agriculture, and Engineering Service, Cooperative Extension, 152 Riley-Robb Hall, Ithaca, New York 14853-5701, U.S.A. (607) 255-7654. It has been edited for presentation here by Alan R. Biggs, West Virginia University.